Classic Amish Kitchen Island but certainly not standard! Enjoy customizing your new kitchen island as much as you will enjoy it for generations! Don't settle for a pre-constructed kitchen island that "kind of" fits your kitchen! This beautiful hardwood, handcrafted Kitchen Island is fully customizable to fit your home and needs. Choose the premium hardwood, the finish, the height you prefer, change the hardware, and finally, order it with or without an island top. 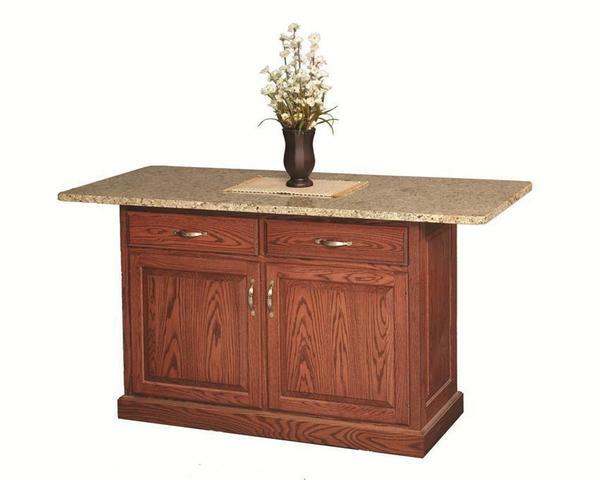 Call to speak to an Amish furniture specialist today about options and ordering on our kitchen islands. You can reach them toll-free at 1-866-272-6773. Height without Top: 34 1/2"
Kitchen Island Top Thickness - 1 5/16", 1 1/2" or 2"
- Antiquity - Our ultimate antique finish. Rub-through of the rich patina are masterfully punctuated with another level of extensive nicks, pin holes, eased edges, simulated cracks and other distressing techniques to bespeak several centuries of robust wear and loving care. To see pictures of counter top materials, first select size, then select material, then click “See Picture" next to the material option. It's here! It looks so beautiful. Thank you very much for your help designing and fabricating the island for us! We are so pleased, it's perfect an looks like it grew there!